The third quarter saw yet another interest rate hike by the Federal Reserve. On September 26th, Fed Chairman Powell announced the Fed Funds target would increase another .25% to a range of 2.0-2.25% and officially removed the term “accommodative” in relation to current monetary policy. With the jobless rate at 3.9% and inflation running right at the Fed’s 2% target, Powell stated that the U.S. economy has a “remarkably positive outlook” at this point. 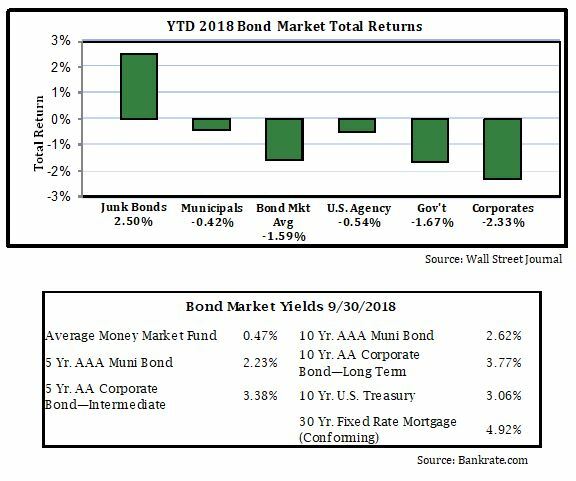 In the week following the rate hike, further strong economic data has caused longer-term rates to move up significantly, while spreads between shorter-term and longer-term bonds have widened. Prior to the rate hike, the benchmark 10-year Treasury was yielding 3.06% and as of this writing, the 10-year is yielding 3.20%. Over the same period, the spread between the 10-year and the 2-year Treasury has widened from .23% to .31%, indicating the bond market’s expectation of continued strong economic performance and further tightening of monetary policy. The Fed is widely expected to raise rates again at their December meeting. For the quarter, junk bonds were up while most other issues were generally flat to slightly positive. In fact, CCC-rated bonds (the junk of the junk) are up 6.4% this year, while long-term investment grade bonds are down 6.6% – a whopping 1300 basis point difference. This indicates there is a large degree of complacency in the bond market at present. We continue to maintain our positioning in the 3-6 year maturity range, although opportunities to lock in higher rates with slightly longer maturities may develop as the Fed continues raising rates into 2019. Chuck is a Principal and has over 20 years of wealth management experience. His responsibilities include business development, marketing and client service. In addition, he serves as a client liaison to OPCM’s Investment Management team. Chuck holds a B.S. in Business Administration & International Finance from the University of Vermont.